Simply Nerdy Mom: Unlimited Notions Subscription Box and GIVEAWAY! 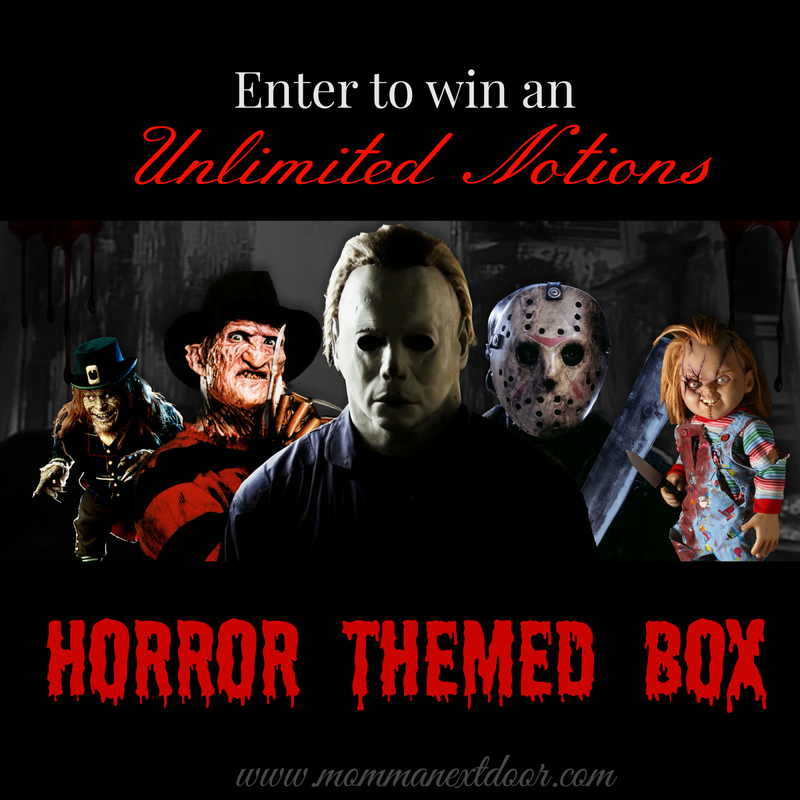 Unlimited Notions Subscription Box and GIVEAWAY! I recently discovered Unlimited Notions, which is a fun new subscription box service that fills your selected genre box with cool snacks, fun collectibles, and awesome teeshirts each month. They have 5 different themed boxes to choose from and 3 different monthly plans for each theme. Choose from Horror, Sci-Fi, Comic, Television, and Gamer boxes at 1, 3, and 6 month subscriptions. Being a bit of a geek, I have to say that choosing between these 5 boxes was difficult. I love all those themes, but my heart has always been with horror so I chose to discover what their horror box was all about. It comes in a plain white box, with no filler. That's awesome in my opinion. You know why? Because you know when you subscribe, that your money is well spent on the items inside the box, than fancy box art and messy box filler. All that comes in your box is the curated items and a little printed note with a list of items in your box and their prices. This was my teeshirt. All tee sizes are unisex and you can choose your size when you order your box. I love Doctor Who and while I'm not in love with Jurassic Park, I liked the movie so this mash-up tee was pretty cool, although, I think it's more of a sci-fi shirt than a horror themed one. It's still way awesome! The tees are made of a soft, comfortable material, too, which is great. The other items in the box were just as cool. Party Mix? Yes, please! Although, truthfully, my husband and son didn't let that bag of munchies last very long. They ate it right after I took this photo. My husband would have eaten it before I even got the photo if I wouldn't have gave him "the look". As you've previously read on my blog before, I love Funko Pop figures. So getting the Pop Ghost Face keychain was fun! The mystery minis are also made by Funko and I got the werewolf. I collect those as well, so that was cool! Oh, and the Daryl Dixon thing? It's a luggage tag! It's like they knew that I'm obsessed with Norman Reedus. Overall, I'm super satisfied with my box and I'm really itching to try out the other themes as well. So many themes for a geek to choose from! Want to win an Unlimited Notions Horror themed box? Enter below!